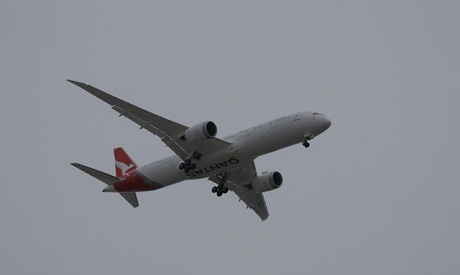 Australia's first direct flight to Britain took off on Sunday from the western city of Perth, cutting flying time roughly three hours by skipping stopovers in Singapore or the Middle East, Qantas officials said. The 17-hour flight, operated by a Boeing 787-9 Dreamliner, will touch down in London at 5.05 a.m., having covered a distance of more than 14,484 km. The flight marked a "historic day for aviation", said airline Chief Executive Alan Joyce. "From today it will be the first link between Australia and Europe that has ever occurred non-stop in aviation," he told reporters at a launch event. "We are so excited." About 730,000 British tourists visit Australia every year and the new service could boost interest in the state of Western Australia, often overlooked in favour of the country's east coast, said Tourism Minister Steven Ciobo. "There will be more opportunity than ever before for us to continue to showcase and highlight all the very best parts of Australia, including some of the most magnificent and iconic parts of Western Australia," he said. The service was a "game-changer", said Mena Rawlings, Britain's high commissioner to Australia. "To have the opportunity to get on a plane at Heathrow and step out in Perth is just phenomenally exciting and I'm sure we are going to see lots and lots of people taking advantage of that." Before the new service, the longest flight to Britain was a journey of 7,275 miles (11,708 km) between Heathrow and Jakarta, operated by Garuda Indonesia, the national carrier. Qantas plans to introduce non-stop flights from Australia's east coast to Britain in the next few years.